The BLACK+DECKER BDERO600 2.4 Amp 5-inch random orbit sander features is the shortest sander in its class, bringing DIYers close to the work surface, which affords them premium maneuverability around their projects. This sander provides fast, efficient material removal with 2.4 Amps of power generating 14,000 orbits per minute. A paddle switch allows for easy on/off during application. Located at the top of the sander, the switch is activated by pressing down naturally with the palm of the hand as if the sander is in use. The sander can then be locked in either the on or off position for convenient, one-handed use. With a compact size and ergonomic design, this tool can get into tight spaces easily and maximize user control, ideal for the DIY homeowner. The Bosch 3725DEVS is multi-purpose random orbit sander with pad that both orbits and rotates, delivering a smooth, well-blended surface finish. It serves the needs of finish carpenters, cabinet makers, woodworkers and others, giving them great performance and results. For enhanced durability and for minimized wobble and vibration, the 3725DEVS features a rugged die-cast aluminum gear housing and dual-bearing pad mount. It also features enhanced random orbit sanding action using an eccentric orbit diameter of 3/16 In. (3/32 In. offset) plus free rotation for fast, for aggressive stock removal or fine finishing. The sander's integral pad dampening system helps prevent swirl marks for a consistent fine finish. This sanders Amp rating of 3.3 Amp evidences it ample power. A dial sets the speed from 4,500-12,000 orbits per minute (no -load) to match the speed to workpiece and task. The DWE6423 5-inch Variable Speed Random Orbit Sander Kit with hook & loop pad has a 3 amp motor that delivers between 8,000 to 12,000 OPM. The separate counterweight reduces vibration and along with the rubber overmold grip provides comfortable sanding. A shorter design allows users to get closer to the work surface and the one-handed locking dust bag attaches securely to the sander to aid in dust collection or the user can attach the sander directly to the DWV010 or DWV012 dust collectors. 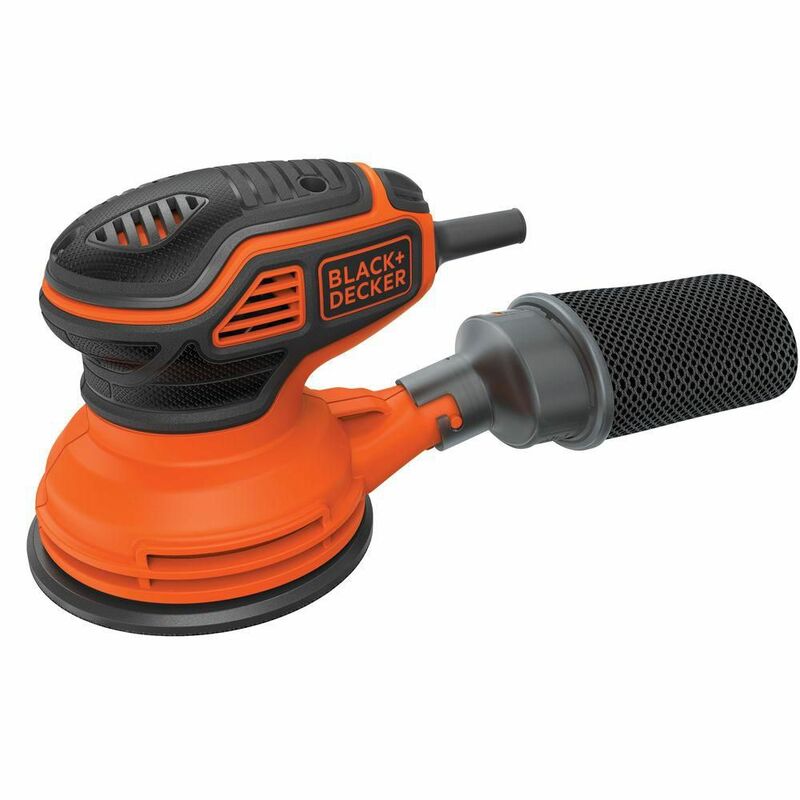 2.4 amp 5-inch Corded Random Orbit Sander The BLACK+DECKER BDERO600 2.4 Amp 5-inch random orbit sander features is the shortest sander in its class, bringing DIYers close to the work surface, which affords them premium maneuverability around their projects. This sander provides fast, efficient material removal with 2.4 Amps of power generating 14,000 orbits per minute. A paddle switch allows for easy on/off during application. Located at the top of the sander, the switch is activated by pressing down naturally with the palm of the hand as if the sander is in use. The sander can then be locked in either the on or off position for convenient, one-handed use. 2.4 amp 5-inch Corded Random Orbit Sander is rated 3.1 out of 5 by 14. Rated 5 out of 5 by Joefish from Best one yet. more power and even collects more dust.... Best one yet. more power and even collects more dust. TY. Rated 2 out of 5 by Dave12 from Would not buy again. I bought the sander mostly because of the name of Black and Decker. I have had many of their tools over the years and they have been fine. The hook and loop wheel on the sander will not hold the sanding disks and wears off the back on the disks which really shortens the life of the disk. I used 20 disks for a job that should have taken 3-4 disks. I was going to replace the hook and loop wheel and 2 wheels cost more that a new sander. Rated 1 out of 5 by Baphomet from Premature wear I bought my second one approximately 1 month ago and the hooks that hold the discs are gone. Last time I will ever buy black and decker. Rated 1 out of 5 by AJ82283 from Bad Used this sander less than two hours total. Smelled something burning and then the bottom went flying off. Very hot to the touch, plastic melted. Doesn't seem to be very good quality. Rated 1 out of 5 by Allen from Just Like the recalled ones This broke off and hit me in the stomach after less then two hours of use out of the box! !